Fall is a wonderful time for taking seasonal, outdoor portraits of your baby. The changing colors of the leaves provide the most perfect, beautiful backdrop for adorable pictures of your little of bundle of joy. Dress your baby in their cutest sweater, grab your camera and head outside for a fun fall photography session. When it comes to photography, timing is everything, especially when you're working with a baby. You're most likely to get the best pictures of your baby if you pick a time when he or she is well rested and has a full tummy. Tired, hungry children make for very poor subjects. If you can, try to arrange the photo shoot to take place at the end of the day just before sunset. It's the ideal time for taking pictures of fall scenery and your baby because the light is a gorgeous golden hue, which will accentuate the warm colors of the changing leaves. Overcast days are often thought of as bad weather for an outdoor photo shoot, but cloudy days are common during this time of year. This type of weather can actually create a beautiful, subdued effect that can't be achieved during other conditions. If your baby is in a good mood and you have the time to snap a few pictures, don't let the clouds stop you! When taking outdoor photos of your baby, avoid shooting into the sun. It creates shadows, lens flare and lowers the saturation of the rich autumn colors you're trying to capture. For the best possible autumn photos, shoot away from the sun or shield the camera lens. Contrast is a key element in any great baby picture, but the rich, vibrant colors of fall leaves let you play up contrast even more. You can always increase the contrast during editing, but there are a few things you can do for "natural" contrast. 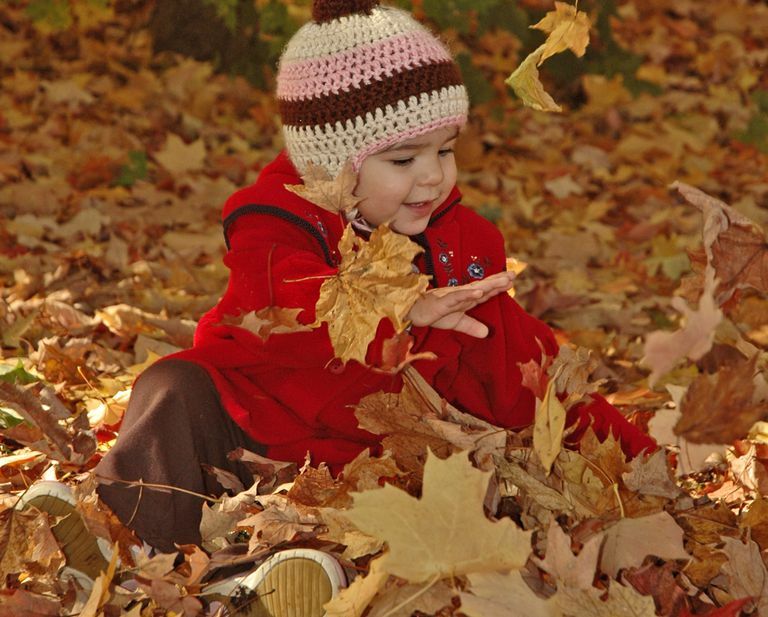 Dress baby in colors that complement fall foliage, like purple, blue and green. Take pictures of your baby playing with golden leaves surrounded by a background of a bright blue sky or snap a picture of them holding a bright red apple while lying on the green grass. Use a white balance setting such as "cloudy" to warm up the colors in your overcast photos. Underexpose your shots to make the colors more deeply saturated. Use the "vivid" mode to make your pictures bolder. Babies grow and change every day during the first few years of their lives, especially their first year. These changes can be so subtle that we hardly notice them. Organize your fall photo shoot to document their growth. Take a picture of your baby in front of a tree in your backyard or neighborhood. Take the same picture from the same spot every day for one month. Once the month is up, you'll have an amazing series of photos that showcase your baby's growth and the seasonal changes.